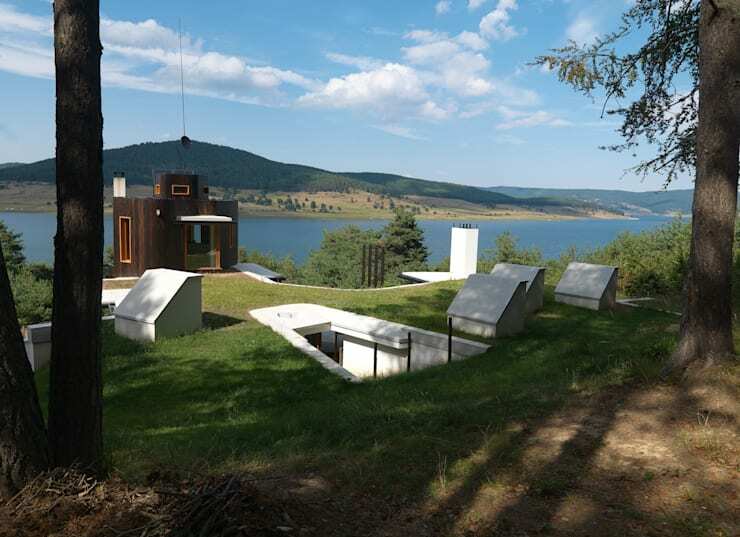 Today on homify we are taking a trip to Batak in southern Bulgaria. Famed for its historical monuments and five impressive dams, the renovated and modern village possesses a rich varied history. Not far from the town of Pestera, the Batak Dam is now a popular spot for contemporary villas and holiday homes, which enjoy the use of the area's abundant fishing stocks. Designed by Simon Gill Architects, this residence is a gorgeous example of a four-bedroom holiday home. Maximising the impressive and idyllic views of the neighbouring lake, the house was built to be used as a base from which to launch fishing trips. With an extreme climate reaching maximums of -20°C in the winter, and 40°C in the summer, the home needed to employ strong insulation and smart building techniques. With a portion of the property sunken into the hillside, the home is intriguing, unique, and boasts an imposing yet stylish impression. Check out the rest of this original and eye-catching property below, and get a little inspiration for your next rural escape. Surrounded by picturesque forests and a stunning lake, this fishing lodge has an interesting and imposing presence upon the landscape. The house has been separated into two different segments. 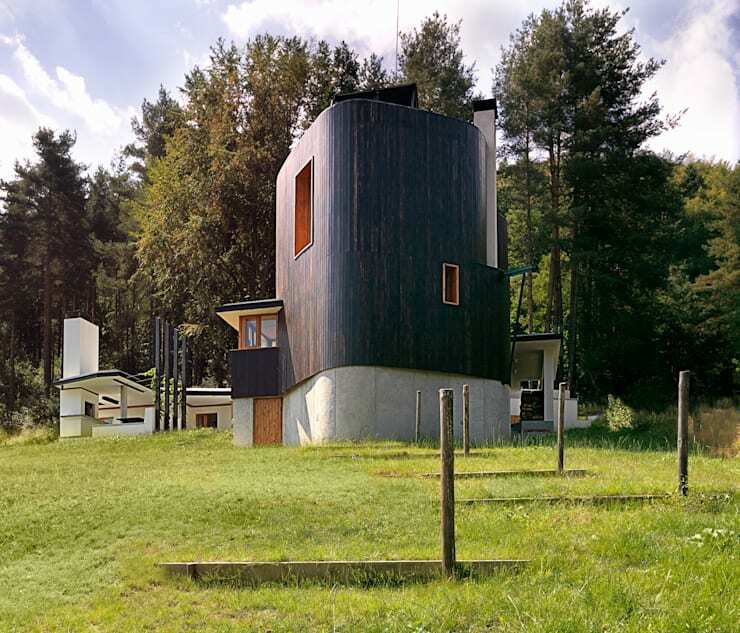 This section is a bold and vivacious timber clad tower type construction, while the second part of the home is built into the surrounding hillside. 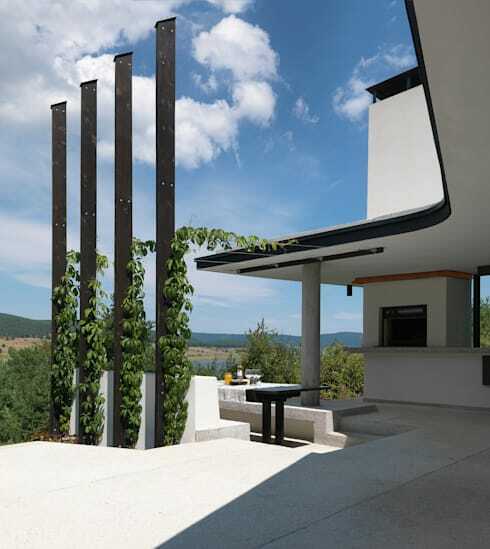 The dark timber that has been applied to the exterior façade is slightly charred to suit the landscape, and is a striking way to ensure the home fits in with its environment, but also looks intriguing and individual. Outside, taking a look at the home from a different direction, we are able to see the abundant entertaining spaces that offer the occupants a place to enjoy the idyllic scenery. The stone flooring is a white hue that looks effortlessly chic, while still feeling in-keeping with nature and the environment. Almost boat-like in its design, several tall posts grow creepers that look wonderfully remarkable and captivating. Maximising its views over the expansive lake, we are able to see how the home has been built into the earth. The property almost becomes part of the sloping hill, and utilises a grassy lawn roof to provide a place to sit and view the gorgeous landscape, as well as insulate the dwelling. As the bedrooms and bathrooms are built into the earth, they enjoy a porthole-esque light well that brings natural illumination into the insulated spaces. 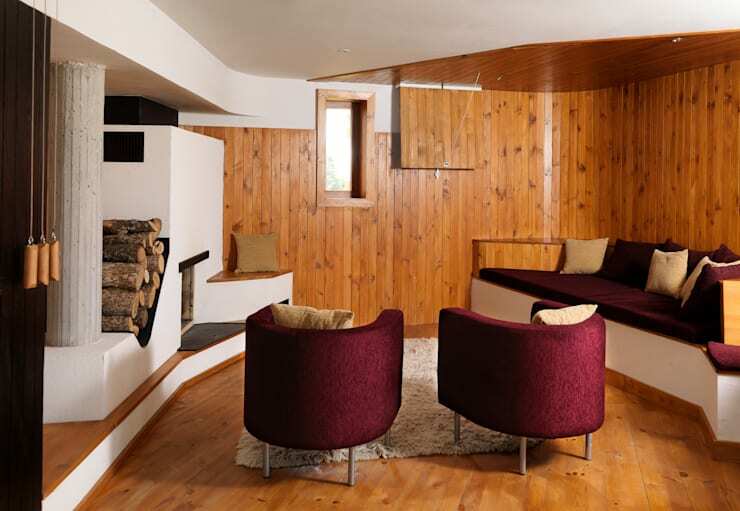 As we check out the interior living spaces of the dwelling, we are greeted with some warm timber clad walls and a den that exudes warmth and cordiality. The bespoke furniture has been built into the shell of the home, providing a space saving alternative to standalone furniture, and evoking a sleek cohesion for the interior. The colour scheme used is a mixture of rich tones, timber, and crisp cream. With a small window, this room feels as though it envelops the occupant, ensuring they are cosy and prepared for the cold night ahead. Moreover, a timber fireplace adds heating to the internal spaces, and provides a gorgeous feature that is stylish as well as practical. 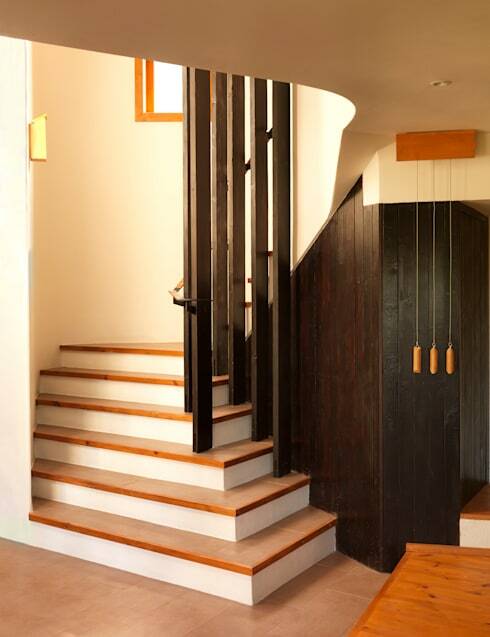 Within the main staircase space, we see the different timbers that have been utilised throughout the home. The slightly charred local larch is employed as a feature of the external appearance of the house, as well as a statement within. Local pine is also used for the internal timber elements, such as the flooring and bespoke joinery. A natural version of the larch has been incorporated to contrast the dark timber, and to add a warmth to the window frames and staircase. 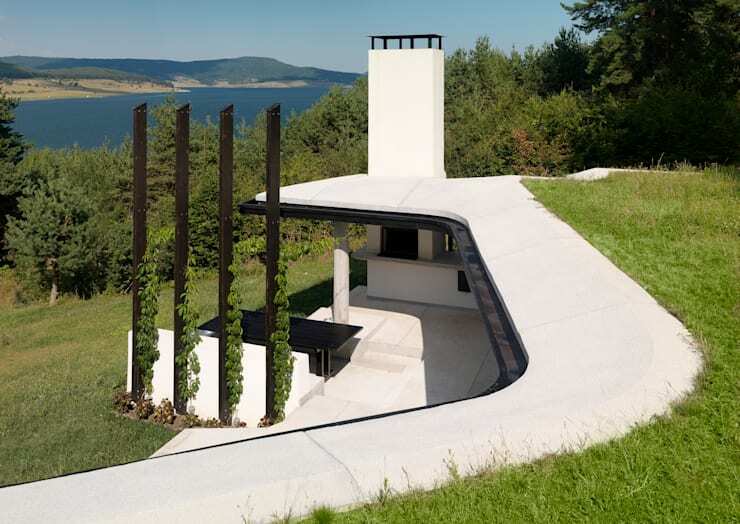 This home celebrates the wonderful aspects of Bulgarian life and is incorporated into the surrounding hillside to ensure warmth, insulation, and a symbiosis with the external environment. Here we can see the area of home that is sunken into the earth. 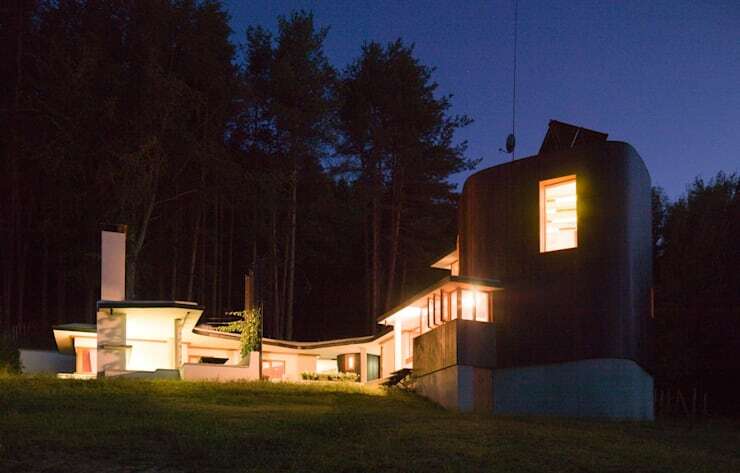 The bedrooms and bathrooms are set within this area of the home in order to maintain a constant temperature, while the other living areas sit within the timber-clad tower. The residence also employs energy saving technology to reduce the home's impact on the environment. Solar panels for hot water, and a wood-burning stove have been added to power the central heating. Taking one final look at the home before ending our tour, we get a good impression of the magnitude and scope of the property. With the lights turned on and the night-time approaching, the dwelling looks welcoming and luxurious. With the sleeping areas dug into the land they are cocooned and safe, while the sloping grass leads to the large forest beyond. The residence is interesting, intriguing, and unique.